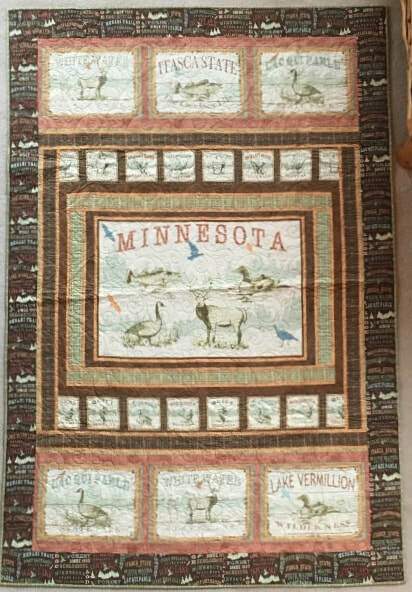 This quilt is made with the Quilt Minnesota 2013 fabric, and features the large panel with Minnesota scenes, smaller blocks with Minnesota State Park scenes, and Minnesota State Park Words on the border. Other fabrics include a brown marble surrounding the inner panel and a rust marble fabric surrounding the State Park blocks, and has a tan leaf fabric on the back. The binding is a green plaid fabric. 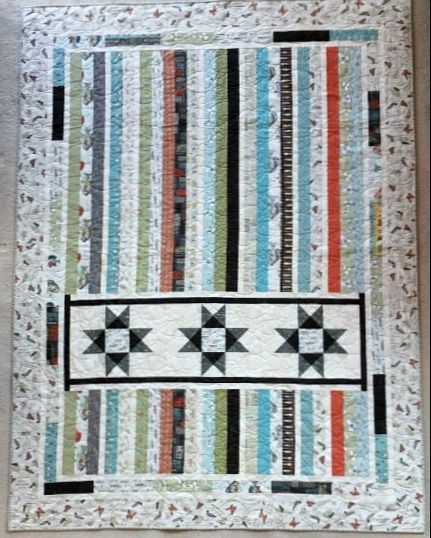 This quilt is made with the Quilt Minnesota 2016 fabric, and features strips of the Minnesota fabrics with fish, canoes, oars, ladyslippers, etc. 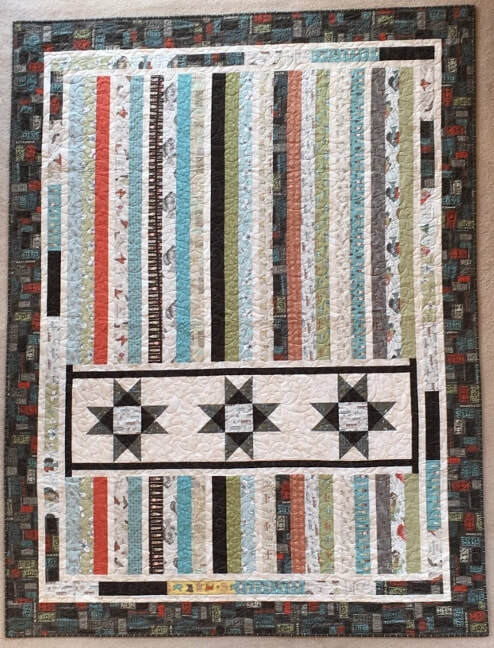 and three big stars with a cream background and Quilt Minnesota 2016 border. It has a cream stripe binding and soft tan Minky backing. 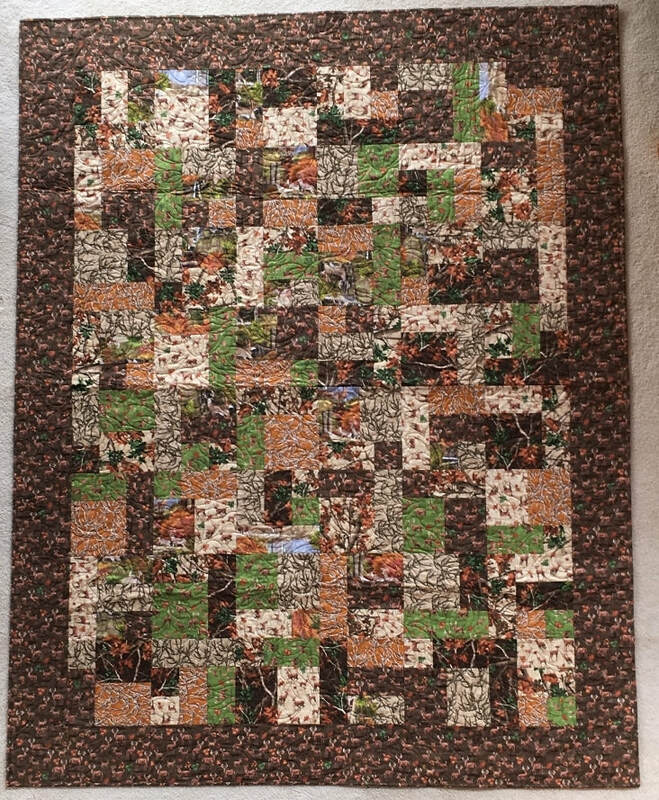 This quilt is made with the Quilt Minnesota 2016 fabric, and features strips of the Minnesota fabrics with fish, canoes, oars, ladyslippers, etc. and three big stars with a cream background and License Plates border. It has a brown stripe binding and soft tan Minky backing. 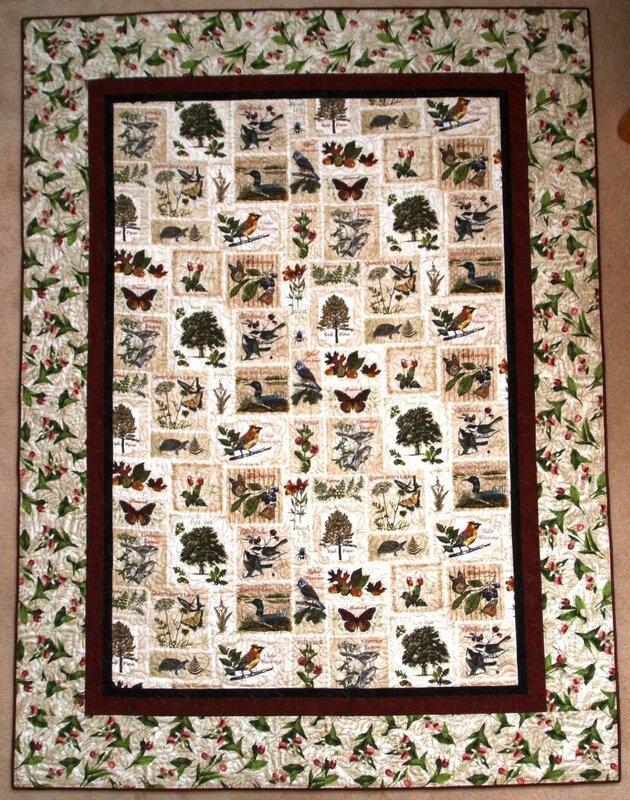 This woodsy quilt is made with some great deer fabrics, with some antlers, leaves, and deer. It has a very nice cream woodgrain backing fabric and brown binding. 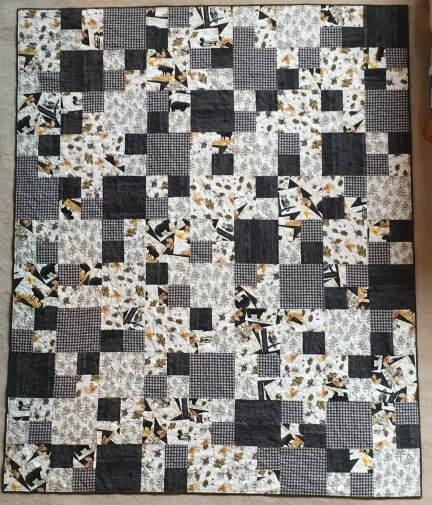 Great for the hunter or a twin size bed! 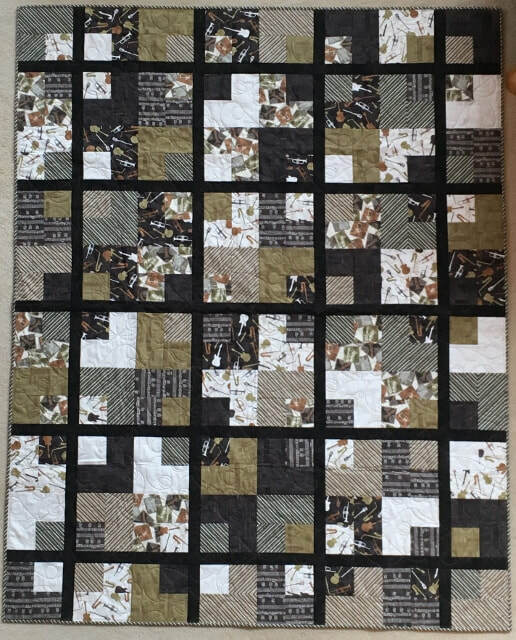 This beautiful quilt is made with 2014 Sights and Sounds of Minnesota fabric, and features a panel with Minnesota "sights" such as the Chickadee, Loons, Lady Slippers and Monarchs, and many others! Other fabrics include a rusty red marble and brown solid inner borders and a Lady Slipper outer border, with a soft tan Minky backing and rust binding. 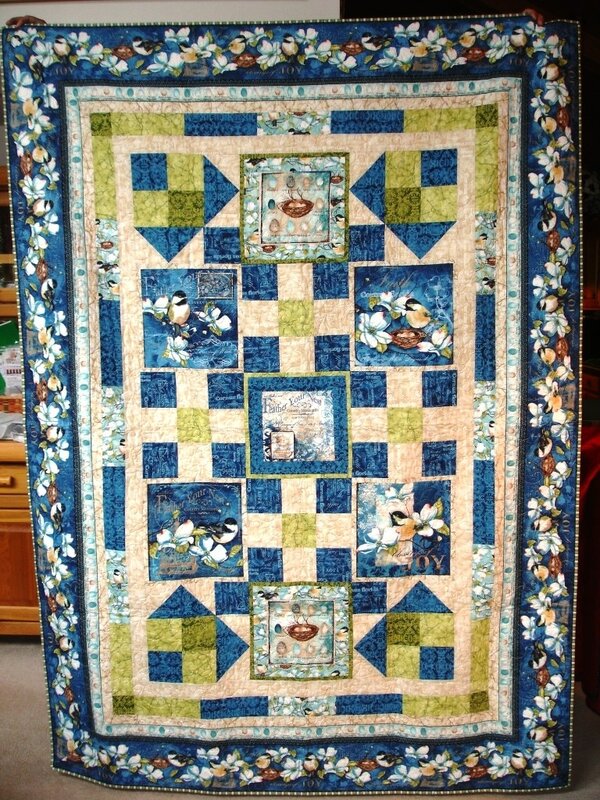 This quilt is made with a beautiful chicadee fabric line called Feather Your Nest. 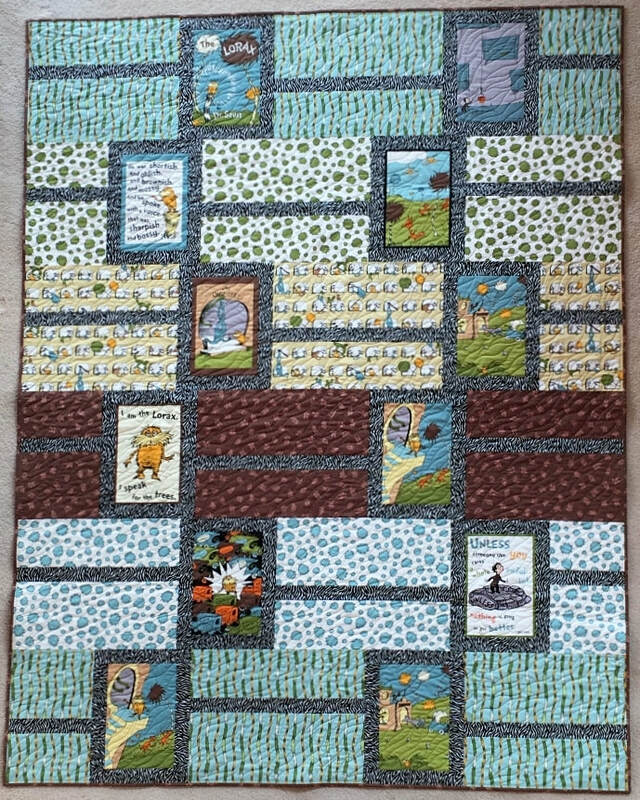 Bigger blocks have chicadees and nests with blues, creams, and greens surrounding. 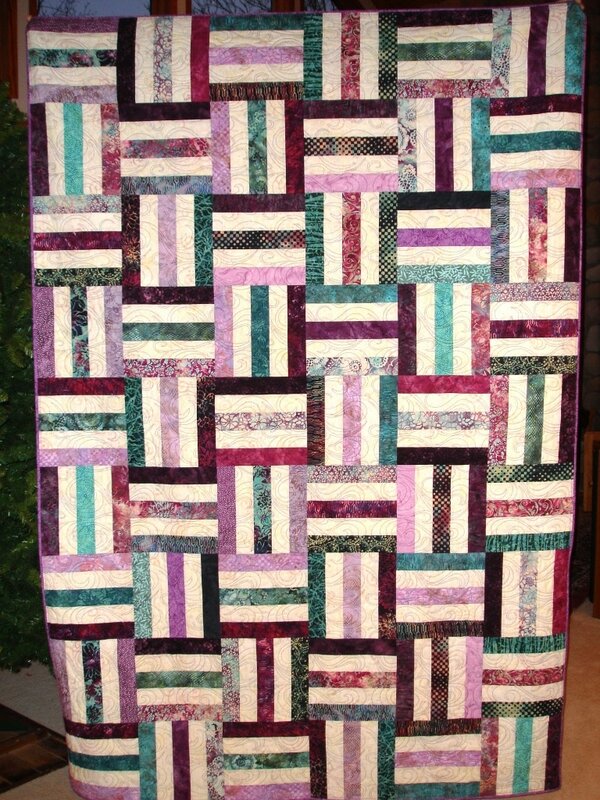 The border is a matching chicadee stripe. It has cute chicadees on the back. 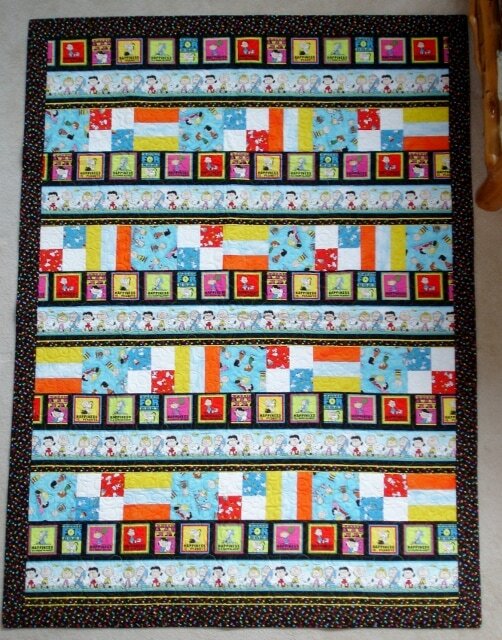 The binding is a matching green stripe fabric.